Stan Laurel & Oliver Hardy were some of the best comedians of all time. Their chemistry & slapstick humor made millions laugh & inspired thousands of people to go into comedy. Stan & Ollie, while not entirely perfect, is a funny & heartwarming look at the iconic comedy duo. Set between 1937 & 1953, the film follows Stan Laurel (played by Steve Coogan) & Ollie Hardy (played by John C. Reilly), who are riding high & are the kings of comedic cinema. However, all is not dandy, as Stan has been adamant in not renewing his contract with Hal Roach (played by Danny Huston). Oliver remains tied to his contract due to a separate deal, & is not let go, thereby separating Stan & Ollie. 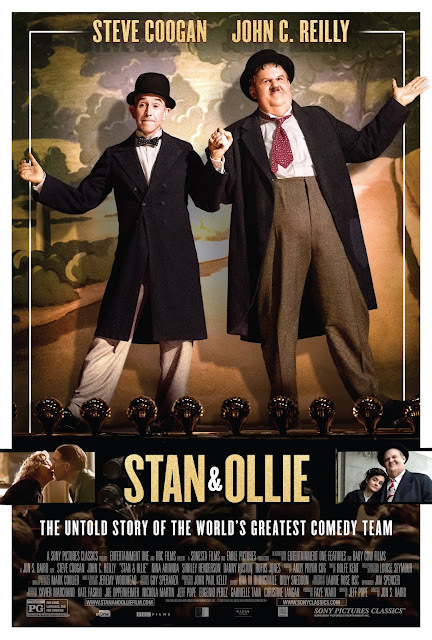 Although they would team up, Ollie's absence at a meeting with Twentieth Century Fox causes them to not be signed, & eventually their friendship becomes strained, as Stan feels betrayed by Ollie. In 1953, Stan & Ollie reunite for a music hall tour of the United Kingdom & Ireland, in order to gain revenue for a comedic reimagining of Robin Hood. They are both married now: Stan to Ida (played by Nina Ariadna) & Ollie to Lucille (played by Shirley Henderson). However, their manager, Bernard Delfont (played by Rufus Jones) has only booked them for very small venues. As a result, Stan & Ollie receive minimal fanfare to start off; however, after doing some publicity, their venues get much bigger & more people come to see them. But long-held animosities threaten to pull the duo apart once again. The cast is fantastic. Steve Coogan & John C. Reilly showcase a perfect mix of comedic & dramatic acting, disappearing into their characters, & their chemistry is terrific. Jon S. Baird's direction is great. Although it's a bit visually stale at some points, Baird is able to overcome that with a surfeit of warm-heartedness throughout. Jeff Pope's screenplay is amazing. The plot feels fresh & inspired, the dialogue is well-written, & the narrative is incredibly sweet & pure. And the makeup & hairstyling is phenomenal. The makeup is incredibly transformative for both of the main characters, as they perfectly resemble their real-life counterparts. This is a great film. Although there are a couple minor flaws, it's an incredibly sweet tribute to an absolutely incredible comedy duo. Stan & Ollie was seen by me at the MJR Troy Grand Digital Cinema 16 in Troy, MI on Friday, January 25, 2019. It is in theaters everywhere. Its runtime is 98 minutes, & it is rated PG for language, & for smoking.